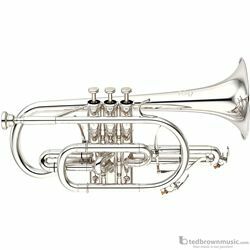 The Xeno name has become well established as the brand of choice for discerning trumpet and trombone players. And now Yamaha has incorporated what they’ve learned developing these orchestral instruments, into some new cornets.The Xeno cornets were developed in close collaboration with some of the worlds best players and in particular David King, cornet soloist, Head of Performance Studies at the University of Salford and principal conductor of the Yorkshire Building Society band. David worked closely with Frankfurt based Yamaha R&D expert Thomas Lubitz, and the new instruments result from more than 20 years of research and experiments.